The ND-GAIN Matrix illustrates the comparative resilience of countries. 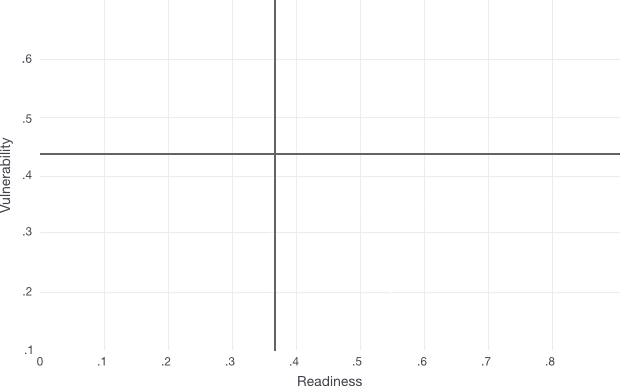 The vertical axis shows the score of vulnerability and the horizontal axis shows the readiness score. A country with a high level of vulnerability to climate change, but a low level of readiness. These countries have both a great need for investment and innovation to improve readiness and a great urgency for adaptation action. A country with a high level of vulnerability to climate change and a high level of readiness is ready to respond, but needs for adaptation are great. The private sector may more likely participate in adaptation here than in countries with low readiness. A country with a low level of vulnerability to climate change and low level of readiness faces relatively fewer challenges from climate change but lesser ability to take in investment. A country with low level of vulnerability to climate change and high level of readiness is well positioned to adapt. Though less vulnerable, these countries still face some adaptation challenges.